The education systems of East and West are like chalk and cheese. Mohammad Lone outlines the South Korean attitude to education. Exams. The bane of the student, yet the very thing that actually makes us 'students'. Having five exams in the space of 7 days this month, I'm in a bit of a pickle with regards to preparation and revision. It's a hard act of committing enough time to study and succeed in the exam, while committing enough rest time to maintain your sanity. And in one of these rare periods of rest I had, I flicked on a documentary on iPlayer, called 'School Swap'- in which 3 Welsh teenagers were taken out of Pembrokeshire and plopped into the wealthy district of Gangnam (yes, that Gangnam) in Seoul, South Korea, where they were immersed into the life of a high performing Korean student the same age as them. The fascinating thing that the documentary highlighted was the stark contrast between not just the education systems, but the entire cultures of South Korea and the UK (and, to an extent, the West as a whole). Education is king in South Korea. 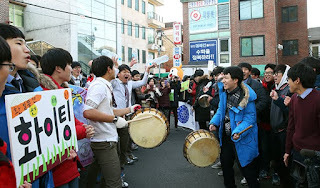 For parents, it is the highest priority for their child, to the extent that there are mass congregations of parents in temples, all praying for their childrens' grades, there are night schools that dominate many of the large streets in Seoul (called 'Hagwons'), and a Maths tutor can become a celebrity figure earning around $4m a year. All this is in preparation for a single exam- the College Scholastic Ability Test (CSAT). This is the test that plays a deciding role in which university a student will attend, and it is believed by many to hold the key to a student's whole career. The day of the CSAT is almost like a national event- whole schools of younger students line the streets to cheer on those taking the exam, government employees are allowed to come to work an hour later so students aren't hampered by traffic congestion, even flights are rescheduled on that morning to minimise noise or disturbance to students. The CSAT is a massive deal in South Korea; after all, it is pretty much the focus of a student's life for 17 years or so. Clearly, South Korea is reaping its rewards from the high emphasis on education. In the 2015 PISA tests (from which a world academic is produced), South Korea came 7th in Maths, 10th in Science and 7th in Reading- as opposed to the UK, who came 27th, 14th and 22nd in those tests respectively. Such a gap in academic ability was demonstrated in the BBC documentary when a Welsh GCSE Maths paper was handed to a Korean class, who, with no previous experience of the format or style, devoured the paper like they had written the thing themselves. And this contrast is not just exclusive to these two countries- it is just a single part of the massive gap between East Asian and Western education systems. The 'leader of the free world', the USA, performed even worse than the UK in PISA 2015, coming a pitiful 40th in Maths, 24th in Science and 24th in Reading. This does beg the question of how many of the world's most highly held universities (Harvard, Oxford and the like) are in these two countries that seem to have weaker education systems than in Asia. One could argue that the Western education systems, while not as rigorous in perhaps mathematics or sciences, provides strength in other areas such as humanities and arts- but this is all for another piece. explosive growth in recent decades. Academic success has been a clear factor in the economic success of a lot of East Asia- South Korea is a great example of this. 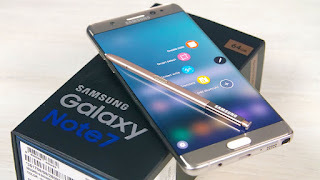 Exceptionally talented businessmen now head up Korean firms such as Samsung and Kia, both of which are proving to be ever more competitive global firms. Even on a more micro scale, the general work ethic and challenge that the Korean education system presents to its students to overcome has proven to contribute to Korea's stellar rise as a developed economy in recent decades. According to Sung Chulchung, a Professor at South Korea’s University of Science and Technology, “Without its well-educated, strongly motivated and highly disciplined workforce, South Korea wouldn’t have been able to achieve such success”. So South Korea is not just succeeding in the PISA scores- it is succeeding in creating a culture of discipline and strong work ethic in its people. An example of how this resilience is built up is in the make up of the school day- as an example, in the documentary, the Korean students were usually up (and studying) from 7-11pm, or even until midnight. The Welsh students, meanwhile, who were sent to shadow their Korean counterparts for just 3 days, could barely handle the first. There is much to be said about how long hours can be detrimental for an individual, much of which is valid, but there are certain life skills such a schedule develops- basic things, like waking up early, using time efficiently, that teens in many other countries are notoriously poor at. 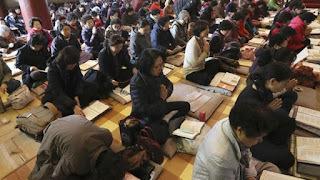 In Korea, for example, many schools punish late comers by making them come in earlier the next day to clean corridors. Teachers command much more respect in South Korea than in much of the West, which in turn leads to less time wasted in dishing out discipline and more time actually teaching. Furthermore, another aspect of Asian cultures in general is that such skills and attitudes are actively encouraged by parents, who invest incredible amounts of time and effort into their children. In much of Asia, it is not uncommon at all to hear parents saving up extra money to be able to fund extra tuition or academic resources for their children. In the documentary, one of the Korean families had relocated to a new home to get their son into a better school. Despite the fact the new house was smaller, it was more expensive- because everyone wanted to get into that school's catchment. Now of course, such behaviours can be seen across the world- but arguably not as visibly as in Asia. But this does come at a cost. As mentioned earlier, one could argue that the education system in S. Korea is too focused on fundamentals, which, while may be important, are considered by many not to be the entire point of going to school to get an education. Furthermore South Korean students ranked among the lowest in the world in terms of happiness, and, shockingly, suicide is actually the leading cause of death among Korean teenagers. This is not something to be taken lightly in the least. It raises a key question, that was raised by those 3 Welsh students who hopped over to Gangnam: the hagwons, the celebrity teachers, the CSAT and the stress and pressure that it brings to the Korean student- is it all worth it? Is it possible at all to have a system that simultaneously instils that work ethic, that academic prowess, into a student, as well as the soft skills, without such a shocking impact?